You’ll be able to bring these Christmas Advent calendars out year after year to fill with festive goodies and a proverb or joke. 1 Fold the doilies in half and cut along the fold. Glue a half doily on to 13 of the small paper bags, trimming them to fit. 2 Once the glue has dried, lay out the bags in five rows of five. Position a small or medium-sized gift tag on each. 3 Using red and brown ink-pads, stamp ascending numbers on to each tag. Stamp a festive picture on to the medium-sized tags, then glue the tags to the bags. 4 Tie the red and white twine and the natural twine into 25 small bows. Alternate the bows, then glue to the hole on each gift tag. Glue a wooden star (or other embellishment) to one bag in each row. Leave to dry. 5 Remove the backing board, mount and glass from the frame. 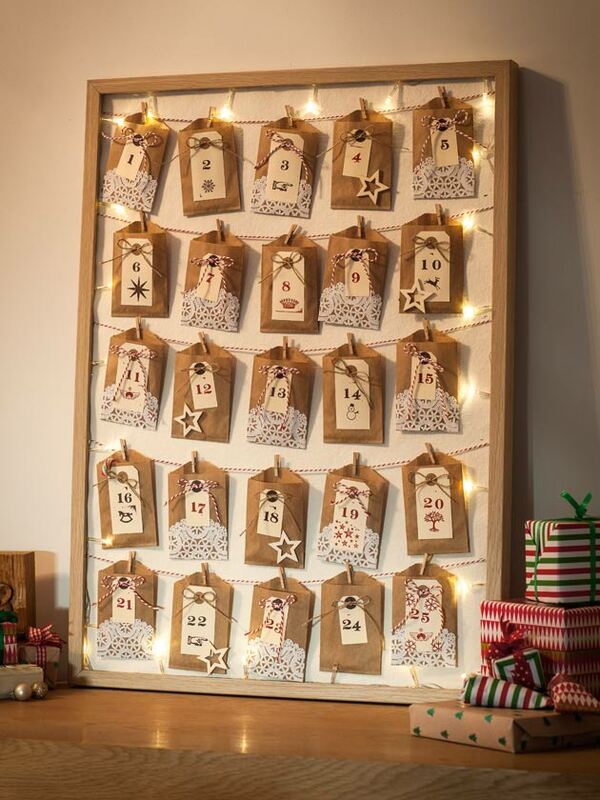 Starting at a bottom corner, attach a length of fairy lights around the inside edges of the frame using sticky tape. 6 Position the bags on the sheet of card. Once you’re happy with the spacing, attach five lengths of red and white twine across the card, securing on the other side with sticky tape (or a staple gun). 7 Place the card and the backing board into the frame. Peg each bag to the twine in order. 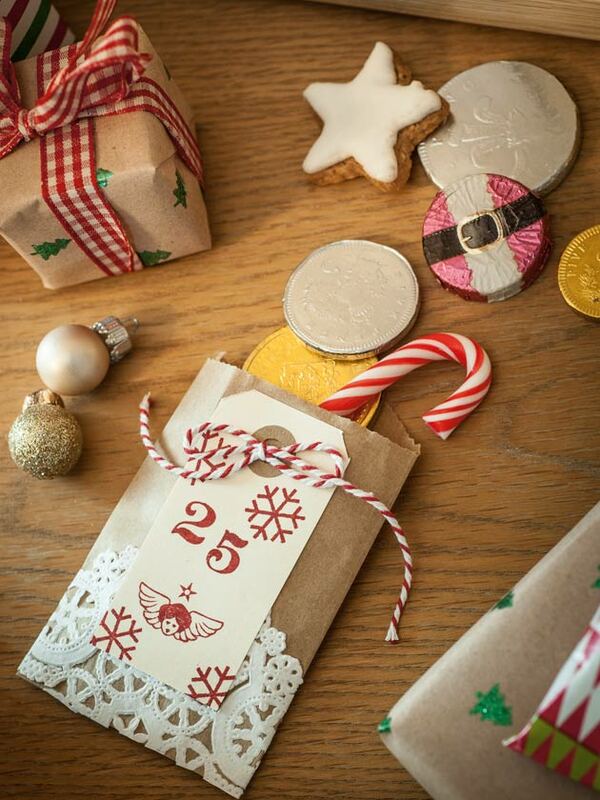 Fill the bags with chocolate coins, candy canes or anything you fancy – just make sure it’s not too heavy. Note: Use LED fairy lights – they’re safer as they don’t heat up, and they won’t melt the chocolate. You could use envelopes instead of paper bags. 2 Once you’re happy with the order and spacing, cut two lengths of twine or ribbon, measuring it to the length of the rows of socks, and leaving approximately 20cm on either side for hanging. 3 Using numbered pegs, attach the socks to the twine in ascending order. Tie a mini bauble between each sock, adding two baubles at both ends of the twine. 4 Hang the lengths along the mantel, down the banisters or on a wall. Stuff the socks with Christmas goodies!